Hotel Bora Bora sits on the edge of a turquoise lagoon nestled beneath the lush green volcanic peaks of Mount Otemanu. There are three beaches and a barrier reef offering a variety of colourful marine life. Enjoy a Honeymoon Escape. In south west Iceland next to geothermal beaches, the spa offers the latest treatments using mineral-rich seawater to cleanse and nourish. The water is particularly good for skin conditions and there is a clinic for the treatment of psoriasis. The restaurant serves and international menu using fresh local ingredients. A modern hotel which has an 18-hole golf course, indoor and outdoor pools, tennis, squash, cycling, horseriding, shooting, volleyball and basketball. Treatments include balneotherapy and mud with several complementary therapies such as reflexology, acupuncture and massage. Chateau de Limelette is a 19th century hotel in Anglo-Norman in style, surrounded by a park with flower gardens, a waterfall, fountains, outdoor pool and gym. 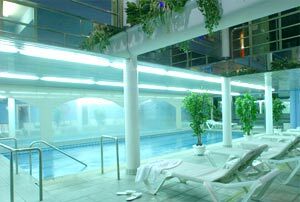 It has Belgium’s largest marine balneotherapy centre. Golf, tennis, squash, mountain-biking and clay pigeon shooting. Surrounded by a park of 3 hectares and a garden full of flowers, cascades and fountains, the hotel lies only 20 minutes away from Brussels and its international airport. There are osteopaths, physiotherapists, hydrotherapists and beauty advisors. Treatments include a large variety of baths – almicronised algae, seawater, mineral salts, hot and cold; Thai and Tao massages. The restaurant has both gourmet and low-fat food. There are eighteen Moorish-style villas with private sunbathing areas and patio/balcony overlooking the sea and set in landscaped tropical gardens with palms. Insulated from the outside world, yet only minutes by air or motor launch from St. Maarten, Cap Juluca is a private self-contained resort along two miles of some of the best pristine white-sand beaches in the Caribbean. Cap Juluca has an array of entertainment amenities, including a fully equipped fitness centre and outdoor activities such as aqua golf driving range, bunker and putting green, croquet lawn, junior Olympic-size swimming pool, a library, tennis courts with a full-time resident pro, and water sports, including snorkeling, wind surfing, water skiing, and sailing. The spa has only two treatment rooms but you can also have these in your own room. A number of alternative therapies are also available such as reiki, shiatsu and yoga. Personal and circuit training can also be arranged. The Thermal centre at Hotel Roc Blanc Andorra features thermal waters appropriated for therapy treatments. The Thermal Centre equipment was renovated in 2001. Treatments include: beauty, health, relax, and antiageing. Facilities at the thermal Centre includes: natural spring hot swimming pool, Jacuzzi, sauna and Turkish bath, gym, UVA rays and massage.